The nights are starting to get a little warmer now although I had to go out and purchase a small wood fire. That also brought some joy as we were driving round for ages to get wood! It was actually a lot of fun until we got back and I had to start cutting the wood up into small pieces! Had some pretty major thunderstorms but i guess that is part and parcel of living out here. Still great though. Been getting further into my course work now, I think I am enjoying it but due to a small error on my part (not reading the details correctly! ), I spent the whole first week doing the wrong thing. So, now it is playing catch up. The Greek lessons are coming along well and we are using it more and more. I can now ask for 6 kebabs instead of one....just joking. Still unsure when we will get back to the UK, may well be after the summer now. Time will tell. We found a really nice taverna which is close by, apparently they slaughter the animals there daily so the meat is very fresh. Delightful. 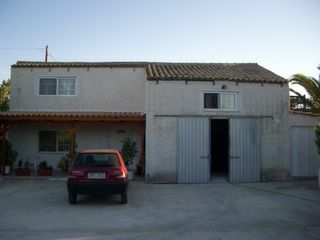 The picture above is our small house, and even smaller car! How things change. It goes to show that size is not everything. The smallest house (and car) I have ever had but the happiest I have been.